You are here: Home » This is the recipe you were looking for, delightful and authentic. This is the recipe you were looking for, delightful and authentic. There are several ways to make a Mexican meatball soup, and this is one of the simplest recipes that I’ve found that my family absolutely loves. These Mexican Meatballs are cooked in a tomato broth flavored with cilantro. There’s no rocket science here, just an easy process with common ingredients and you’ve got an extraordinary soup that I’m sure everyone in your family, even the little ones, will love. This soup can be found at many Mexican “fondas”, small mom and pop restaurants that sell meals at noon for the office workers. It is also a popular way to use ground meat. It is a very versatile soup, allowing you to add vegetables or other types of herbs to season it. You can also mix half ground pork meat and half ground beef. Other meatball soups add cooked eggs or rice to the meat mixture; you can check out two other options here on the blog: Chipotle Meatballs and Jalisco Style Meatballs. Some cooks in Mexico use granulated chicken bullion instead of the chicken broth. Follow the package directions to make the 4 cups of broth needed. You can add other diced vegetables like carrots, potatoes, zucchini, chayote, and potatoes to the broth while it is simmering. If adding carrots, add them at the beginning with the tomato sauce. Other vegetables will take less time cook and can be added when you add the meatballs. I prefer to buy ground meat with a little bit of fat, like the one sold at the market with an 85/15% of fat content. It has more flavor, and you can easily remove the fat after it floats to the surface of the broth. 1. Place the tomatoes, onion, and garlic on a hot griddle to roast. Turn occasionally to have an even roasting (about 5-7 minutes). Once roasted, place in your blender and process until you have a smooth sauce. If your tomatoes aren’t juicy and your blender is having a hard time blending, add ¼ cup of water. boiling, reduce the heat to simmer. While the sauce is cooking we will start forming your Mexican meatballs. 3. To form the meatballs: In a small bowl, soak the bread with the milk until it is softened, about 1 minute. 4. Place meat in a large bowl and make a well in the center. 5. Grind garlic clove and peppercorns in your molcajete (the flavors won’t be able to compare if you use the dried form, but they’ll still work fine). Once ground, add it to the meat, as well as the bread soaked in milk and the beaten egg. Season with salt. 6. Gently mix with your hands or a wooden spoon. Do not over-mix or your meatballs will be hard. Next, form the small balls (the size of a golf ball) with your hands, without forcing or putting too much pressure on the meat, and carefully drop them into the simmering tomato broth. Keep making the meatballs, repeating this process. Once all of the meatballs are in the broth, cook for another 15 to 20 minutes. 5 minutes before they’re done, add the chopped cilantro and season with salt. 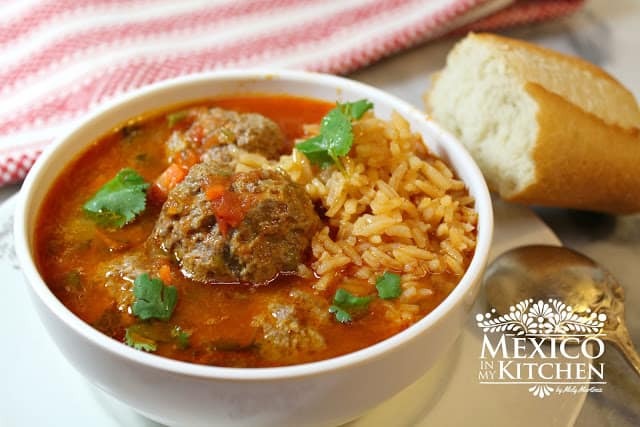 This Mexican Meatball soup is traditionally served with rice or beans and warm corn tortillas. They are really delicious and a very comforting meal. 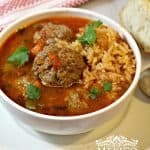 There are several ways to make a Mexican meatball soup, and this is one of the simplest recipes that I’ve found that my family absolutely loves. These Mexican Meatballs are cooked in a tomato broth flavored with cilantro. A delicious and elegant dish that’s perfect for a nice dinner. Place the tomatoes, onion, and garlic on a hot griddle to roast. Turn ccasionally to have an even roasting (about 5-7 minutes). Once roasted, place in your blender and process until you have a smooth sauce. If your tomatoes aren’t juicy and your blender is having a hard time blending, add ¼ cup of water. Heat 1 tablespoon of oil in a large saucepan at medium high heat. Once it is hot, gently pour in the sauce and cook for about 5 minutes and then add the chicken broth. Keep cooking. When it starts boiling, reduce the heat to simmer. While the sauce is cooking we will start forming the meatballs. To from the meatballs: In a small bowl, soak the bread with the milk until it is softened, about 1 minute. Place meat in a large bowl and make a well in the center. Grind garlic clove and peppercorns in your molcajete (the flavors won’t be able to compare if you use the dried form, but they’ll still work fine). Once ground, add it to the meat, as well as the bread soaked in milk and the beaten egg. Season with salt. Gently mix with your hands or a wooden spoon. Do not over-mix or your meatballs will be hard. Next, form the small balls (the size of a golf ball) with your hands, without forcing or putting too much pressure on the meat, and carefully drop them into the simmering tomato broth. Keep making the meatballs, repeating this process. Once all of the meatballs are in the broth, cook for another 15 to 20 minutes. 5 minutes before they’re done, add the chopped cilantro and season with salt. 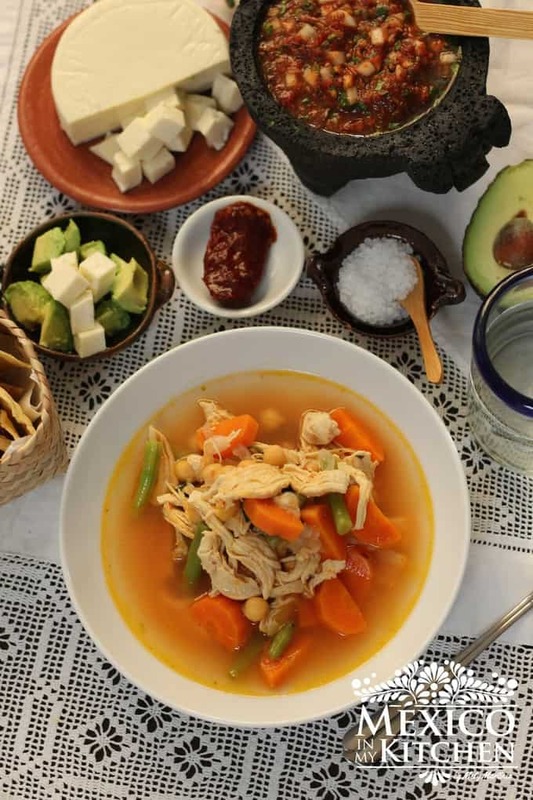 This soup is traditionally served with rice or beans and warm corn tortillas. They are really delicious and a very comforting meal. 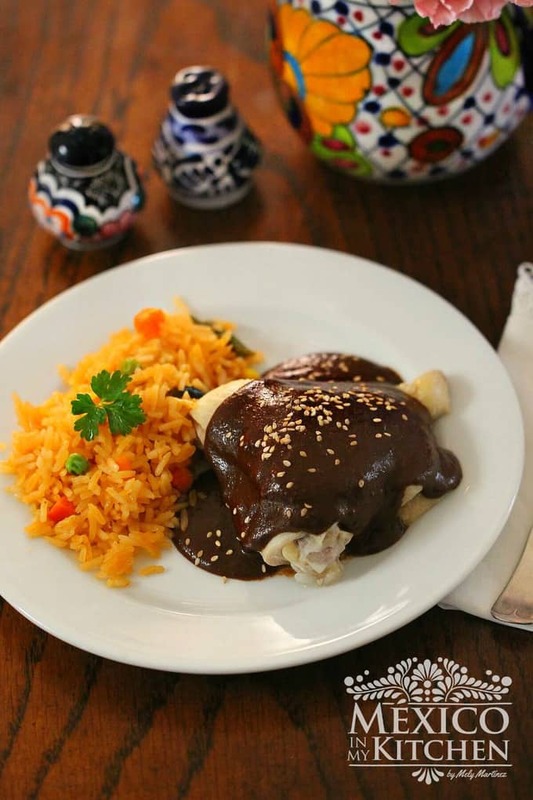 • Some cooks in Mexico use granulated chicken bullion instead of the chicken broth. Follow the package directions to make the 4 cups of broth needed. • You can add other diced vegetables like carrots, potatoes, zucchini, chayote and potatoes to the broth while it is simmering. If adding carrots, add them at the beginning with the tomato sauce. Other vegetables will take less time cook and can be added when you add the meatballs. • I prefer to buy ground meat with a little bit of fat, like the one sold at the market with an 85/15% of fat content. It has more flavor, and you can easily remove the fat after it floats to the surface of the broth. If you like this Mexican Meatball Soup Recipe, please don’t forget to leave a comment! Mexican Meatloaf Recipe Super Moist! Any type of tomato? Do you prep them any special way or just twhole and roast, then into the processor? I want to make it for a friend for her birthday she loves mexican but her Mom is an amazing Mexican cook. I usually use the plum tomatoes since they make a thicker sauce. And, yes to your second question, just roast them and them to the blender, they will finish cooking on the stew. Happy cooking! I hope you like it! Mely! I didn’t know you had this recipe on your site!? I have to make this ASAP! I hope you try it and come back to let me know how do you like it. It is a real winner with the family. I am Mexican and LOVE the food! 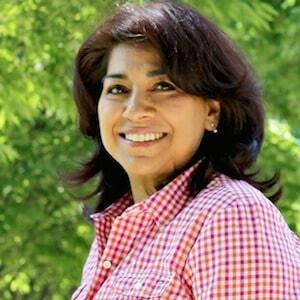 I’m so happy to follow Mely, her recipes are authentic and delicious! This soup is out of this world! I always serve with Mexican rice in a bowl and ladle the soup with meatball over it. Sprinkle cilantro and eat with flour tortillas, DELICIOUS!